Markus Held was born in Heidenheim in 1973. At the age of seven, he had his first contact with the classical guitar. Today he lives in South-Germany near the Swiss border between Freiburg (D) and Basel (CH) in Müllheim-Vögisheim. His workshop is situated in the same building. 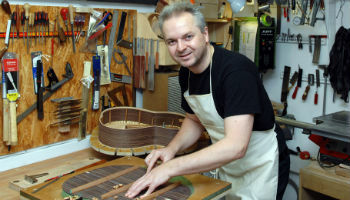 Since 2006 he has been building traditional Spanish-style concert and flamenco guitars. Beside his actual profession as an engineer his education consisted of the intensive analysis of the old masters and their instruments. Intuitively, with the help of his engineering knowledge of mechanics and dynamics, he now builds guitars with a high level of craftsmanship and his own tonal character.